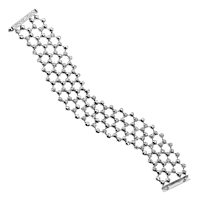 A striking set in the form of a Cartier tennis necklace and tennis bracelet. The necklace totals 16.5 carats of diamonds and the bracelet has an additional 8.2 carats of diamonds, and both are set in 18k white gold. This diamond gold tennis necklace and bracelet by Cartier were created in rows of gold with diamonds spaced throughout in a delicate latticework design. A masterful addition to any wardrobe, as evidenced in the design of this diamond gold tennis necklace and tennis bracelet by Cartier.